At Dalia, we always seek examples from the local private sector that believe in the role of corporate social responsibility (CSR) in strengthening the Palestinian civil society. Of those institutions, there is Palestine for Development Foundation (PsDF). A national non-for profit Organization (Company), founded by Palestine Investment Fund (PIF). We held an interview with representatives of PsDF, as they are currently donors for IBDA’ Youth program at Dalia. Because we always aim to seek independence from external resources, while mobilizing local resources to achieve our own durable development as a people of Palestine. Why does PsDF believes in Corporate Social Responsibility (CSR)? The Palestine for Development Foundation (PsDF), was established by the Palestinian Investment Fund (PIF) in 2014 as its social investment. PsDF aims to invest in human capital, by adopting relevant strategic goals to strengthen people’s skills and capacities and support them to fully participate in employment and social life, which will eventually generate a self-reliant Palestinian economy and entrepreneurship culture that are able to create and develop innovative, competitive and creative Palestinian communities. How do you realize your goals in CSR? The Foundation works within the available means, to support a number of local institutions and associations with specific missions and vision that provide social, cultural, economic, educational and other services to contribute to a positive change in the local society. Economic Empowerment Project: As part of this project, PsDF supported Dalia Association to be able to implement their IBDA’ Youth program. The project aims to make youth more aware of their economic choices and part of a pipeline of potential talents. It will equip them with critical skills for better employment opportunities and inclusion in the labor force. Youth will also be exposed to mentoring and training opportunities to facilitate and enhance the development of their business ideas. The IBDA’ youth program strives to encourage youth and integrate them in the local economy, through knowledge exchange, training, and experience, in order to equip them with the right tools to start their income generating initiatives, while supporting community issues. Jerusalem Grant Facility: The project was launched at the beginning of 2014. The facility aims to promote private sector growth and development in East Jerusalem by supporting new and existing business enterprises and ventures, and contributing to the creation and sustaining jobs and business opportunities. The program targets Small and Medium Enterprises (SMEs) working within several economic sectors, including tourism, manufacturing, trade, IT and tourist transportation. It provides funding in the form of matching grants to projects that demonstrate the ability to implement expansion plans and develop trade activities, to achieve sustainable growth and higher attractiveness to potential investors. Economic Empowerment of Palestinian Refugees in Lebanon Program: The purpose of the program is to enhance living standards, reduce poverty levels and unemployment rates within Palestinians living in refugee camps and communities in Lebanon. The Program provides microfinance services to entrepreneurs in Palestinian communities and refugee camps, to help improve their living standards and offer them a stable income. What are the types of projects/initiatives you fund? As mentioned earlier we run an integrated program of social responsibility and the development initiatives focus on promoting leadership and innovation in Palestinian society while motivating young people to engage in the local economy and the labor market. We also focus on supporting sustainable activities, and projects and that aim to develop the Palestinian economy, creating new employment opportunities for youth, transferring and exchanging knowledge, improving the living conditions of Palestinians in marginalized areas, and allocating support to projects, programs and cultural events with clear objectives. We noticed you target the youth, could you elaborate on the reasons for this particular target? After conducting a needs assessment study for the Palestinian market, we found that there is a need for employment and training opportunities for graduates from vocational and technical colleges, and this is why we support the Dalia Association’s IBDA’ youth program, which encourages the youth to lead their community through developing and meeting the needs and requirements of their local economy. Why do you target sustainable economic projects? We aim to achieve sustainable economic projects in the belief that we have to create programs that have a sustainable impact, which contribute to the development of our Palestinian society. Therefore, we dedicate our energies to supporting programs that contribute to the Palestinian economy and its development either directly or indirectly. Can you provide us with success stories? Through implementing the economic empowerment project by supporting the IBDA’ youth program at Dalia, we have witnessed great and positive impact and success. Youth have received the needed training and they are currently implementing their community initiatives successfully. What is PsDF’s vision for CSR as a whole in a) community philanthropy* and b) in contributing or even in leading community development in Palestine? CSR is an important part of the Fund's mission and commitment to the Palestinian society. We allocate part of our annual budget to support and implement a range of projects that benefit the community. In order to be pioneers in social responsibility, we are constantly working on partnerships with institutions in the public and private sectors. We are working to establish cooperation with Arab and international partner institutions willing to contribute to the Palestinian society. Through our work in various projects and in partnership with a group of local institutions, we contribute to improving the economic opportunities of young people and opening new horizons for them to be pioneers in their communities and able to contribute positively and fruitfully. * Community Philanthropy includes mobilizing local resources (money, spaces, skills, expertise, etc...) for community-controlled development to create positive social change. In Palestine, this system is known as Al Ouna, which is our indigenous aid system. Proceeding with our work, we are now following up with the youth and providing them with technical assistance to continue with their initiatives, such as creating action plans, to successfully implement these initiatives and ensur their sustainability. 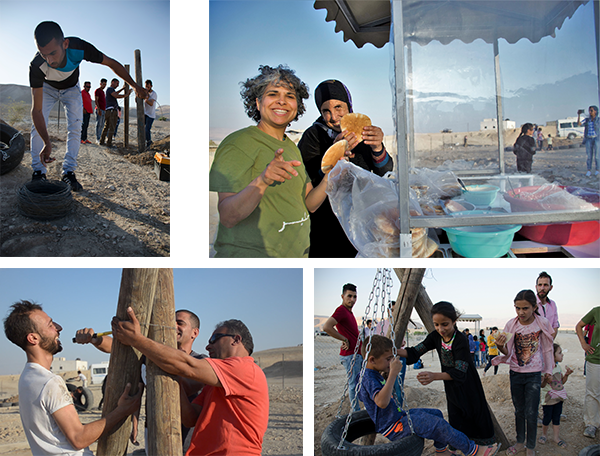 Fasayil’s Community Park and Al Naseem’s mobile food cart: We organized a volunteer day mobilizing our friends and participants from the IBDA’ Youth program to help the local community in Fasayil in building the community park. Delicious sandwiches were provided by Al Naseem’s mobile food cart. 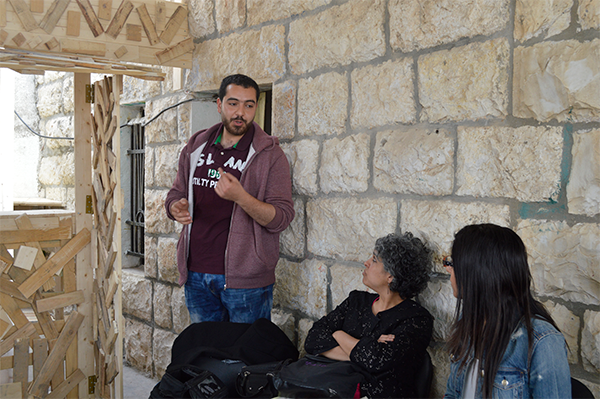 On this day, we also visited Al Jiftlik’s initiatives: Sanabil Al Reef Kitchen, were we learned more about the difficulties the local community faces from the surrounding Israeli settlements. We also stopped by Al Ghuzlan sports and health center. For more photos of the volunteer day you can visit the album. 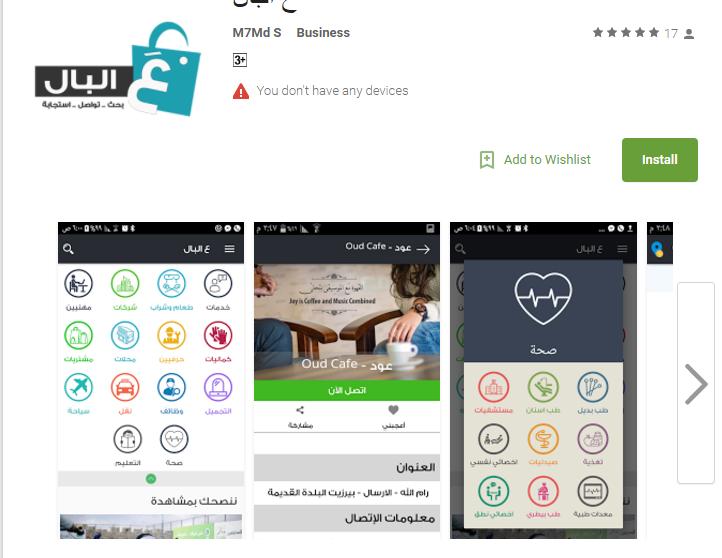 We connected Qurtaleh store from Mazari’ Al Noubani with the online platform Mostawda that sells local Palestinian crafts. The store will now sell the local craftworks in the town itself and online. In Saffa, the youth held Ramadan evenings in their newly established Al Moruj community park. Photo from: Al Moruj Center for Development. SmartPal (‘Al Bal): the youth of this initiative held the soft launch, at our office, for the search engine application (app) for local Palestinian stores, touristic places, local crafts workers and other places in Jerusalem as a start, and then they will expand with the app to cover the whole of Palestine. You can download the app here. 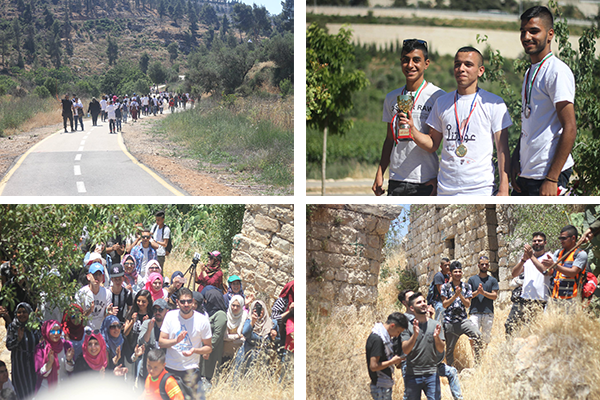 ‘Awditina initiative: the youth group held two activities that aimed at introducing the community in Jerusalem to destroyed villages during the 1948 Nakba, and to revive the Palestinian culture and heritage in those villages. The first one was held in the village of Lifta, where 100 participants had Palestinian Ka’ek (sesame bread) for breakfast, and enjoyed a Dabkeh show. In a marathon, they continued their tour to Qalonia village which was also destroyed in 1948. The second activity was held in the village of Jora. 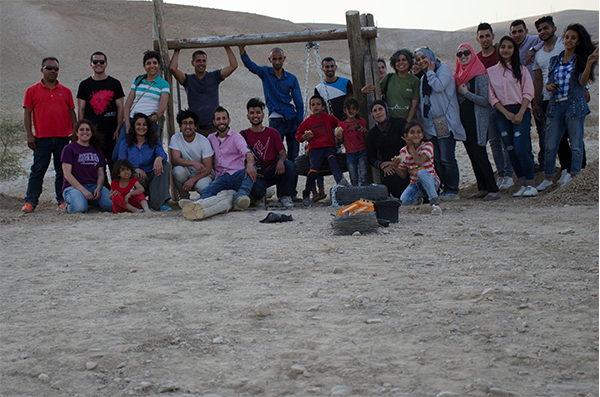 With Ramadan lamps, they toured the destroyed village, and shared iftar together in a cultural evening. 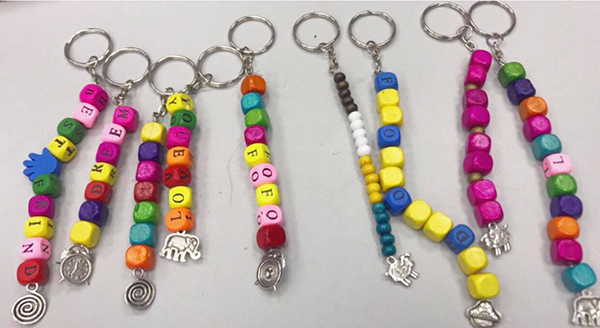 Love Syndrome: the youth behind this initiative aim at including children with special needs, especially those with Down syndrome, to build their capacity to produce crafts and art products for sale. 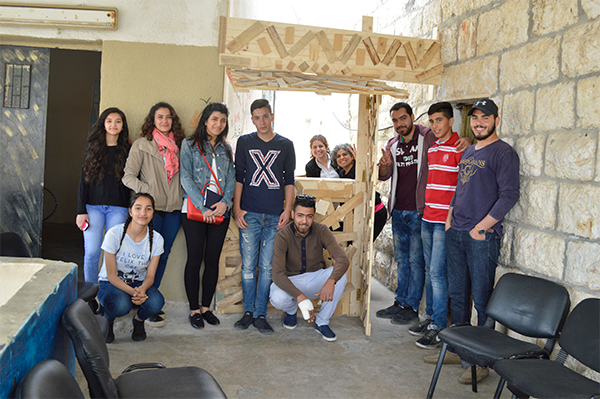 They held an activity with Al Bakrieh “B” School in Beit Hanina to sell their products. They also plan to hold a Bazaar in the coming month. “Ma Kan Fee w Hala Fee” (there was nothing, but now there is everything): an initiative from the youth women in the Bedouin Arab Al Jahaleen community that will focus on raising awareness of the children in the community through cultural and entertainment activities. Al Shari’ Al Akhdar (The Green Street): an initiative from the youth in Al Eizariyeh that will focus on creating a green, healthy and social space for the local community; it will also include a cafeteria that provides healthy nutritious meals. Several training workshops took place in North and Central Gaza. 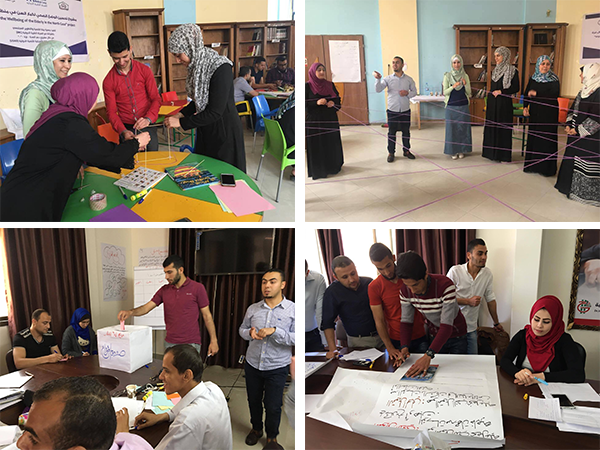 The trainings included topics such as local communities, creative thinking, local economy, cash and non-cash resources, and writing initiatives. Happy Zone: This initiative will focus on producing locally hand-made products and crafts to provide job opportunities to unemployed women (recent graduates and housewives with experience in handicrafts). They will employ raw unused materials from sewing factories, and carpentry. In addition, they will train the youth to exploit existing opportunities and alternatives. In the end, they will integrate the handicrafts with the technological sector by creating an electronic marketing platform. Social Land: The initiative will focus on rehabilitating and expanding Beit Lahia’s municipality park, thus creating a safe and entertainment space for children and their parents. Diala Style: An initiative/company focused on the design and marketing of clothing by Palestinian designers. The idea is to invest in the creativity of young women in Gaza and to promote the company to become a brilliant name in the field of design and marketing emerging from the central region. Gradually they hope to become an important company in the world of sewing and design from Gaza. Derna Store: an economic, social investment in local environmental resources through the recycling and manufacturing of raw materials available in the environment of Deir El Balah city. The products will be sold as high quality for use in homes, parks, kindergartens, and other uses. The initiative will also hold cultural exhibitions and cultural events. 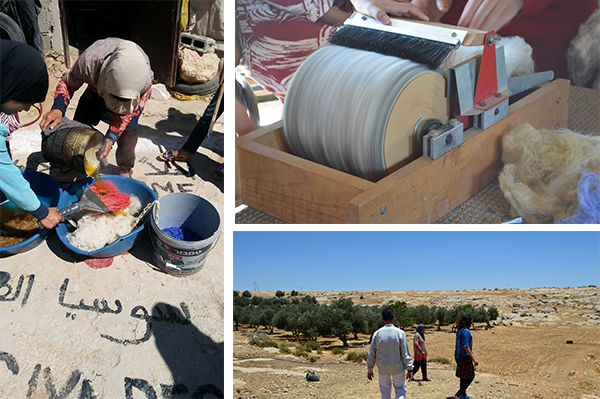 In order to support their implementation, technical assistance was provided to the women groups in south of Hebron. Zainab, a community leader from Jiftlik, spend time in Susya, South of Hebron training women from The Rural Women’s Association in wool production, and the use of natural dyes. 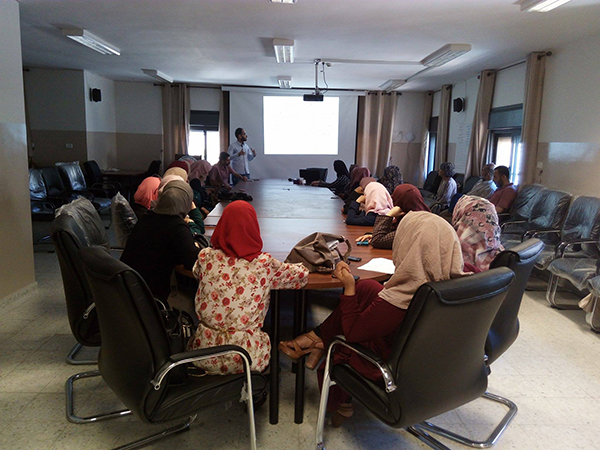 The women groups are also preparing land to establish an agroecology farm with the help of agroecology expert Saad Dagher in the village of Tawani. The association “Esnad For Student Support” has joined our big family on May 10th to create the “Esnad Education Fund” to raise funds to send 10 students to get a higher education. Dalia is currently using its peer-to-peer fundraising platform. 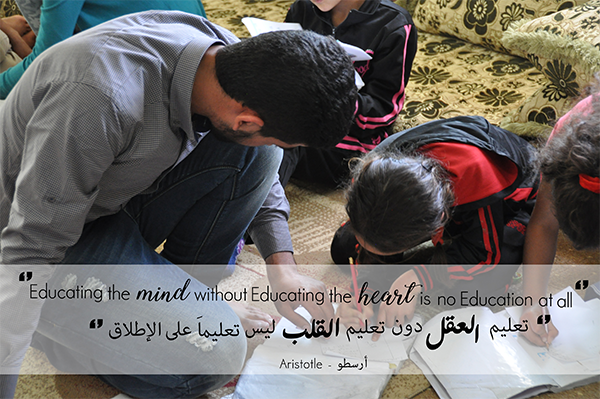 In Arabic, Esnad means support, which is exactly what we aim to provide for Palestine’s youth, as we believe in the important role of education in shaping the future of our country. But what makes this fund special, is that the receiving students give back to their local communities by tutoring schoolchildren in different subjects such as math, Arabic, English and sciences, in order to enhance their academic performance. If you don’t have online credit cards, you can donate offline. Stop by our office at 4 Al Sahel Street, Ramallah. And thanks to all who have donated or fundraised for this cause so far! You are awesome! Giving doesn’t always necessarily mean money. Giving also includes volunteering with your time to a cause you believe in. Al Hakawati Youth group, from Al Bireh, believes in this, and they volunteered their time to help us with our second hand shop initiative Dukkan. Between the rattle of plastic bags, and the stacking of dishes, the young group of men and women were going through the donated items from the Palestinian community. One bag for women’s clothes. Another for babies. This box for coffee cups, the other for dishes. “Do you think this is still good?” asked one of them. “Let me see” another grabbed a yellow dish with a crack in the middle. “No, just throw it”. He gave it back to the girl; she threw it carefully in the trash bag next to her. They proceeded with categorizing all donated items for almost two hours. From volunteers who give their time, to a community that donates its used items, Dukkan is indeed a model of community giving. On another note, Mobile Dukkan is currently taking place in Jiftlik in the Jordan Valley. Zainab and the women in the town are selling the used items at a low price for their community. If you believe in Dukkan, you can give your items a second life, and support the local community! Because Dukkan is Dalia’s effort to make effective use of the resources available in our country, and to decrease waste going to landfills, thus decreasing pollution. The shop also increases access of needed goods at a budget price, so that everyone in our community can purchase what they need. This generates a bit of income for the Dalia Association, and it will increase the number of our community-controlled grants, so that more people in our community can benefit from these grants, therefore decreasing our dependence on external resources.